Personalized Globe Clocks, Custom Engraved in Bulk. Promotional, Inexpensive. Budget Prices in the USA and Canada. 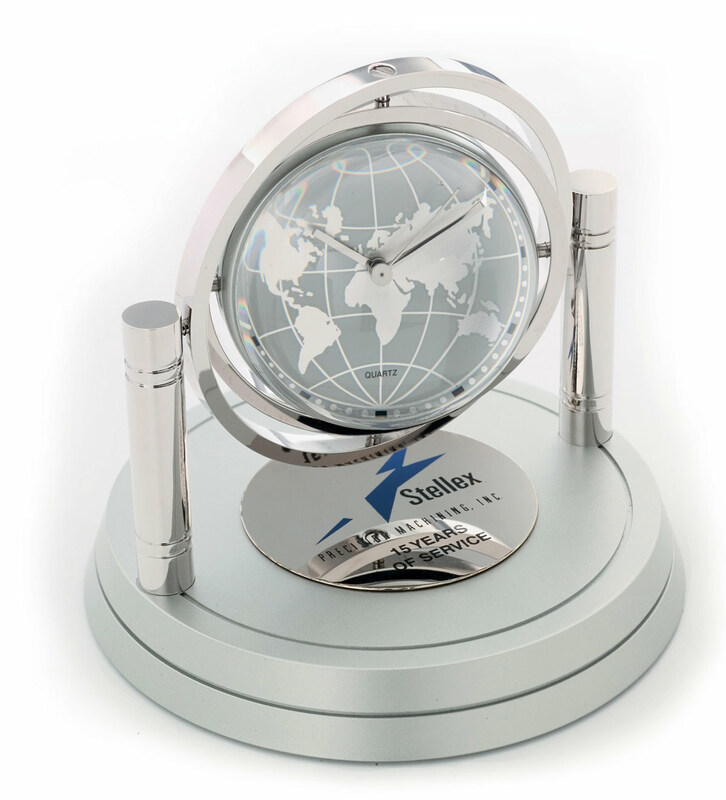 Discounted customized Globe Clocks at wholesale prices. 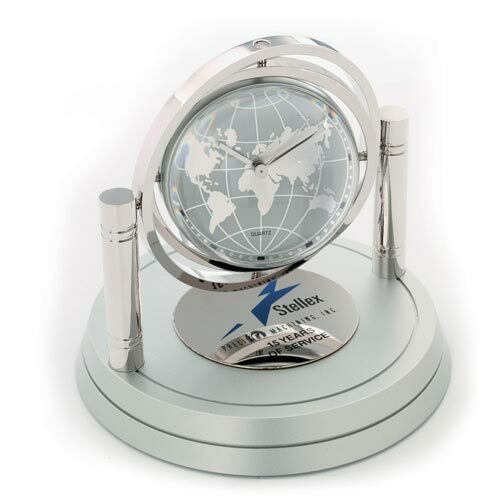 We also supply blank (not custom imprinted) Globe Clocks at EQP (End Quantity Price). Budget Prices in USA and Canada for advertising Globe Clocks. American clients pay no taxes. The unit prices below include your 1-color custom imprint on one side. We also supply blank (not imprinted) Globe Clocks at EQP (End Quantity Price). PRODUCTION TIME: 5-10 days after art approval; Blank Globe Clocks ship next day. Rush Production is available: contact us. The 3-dimensional appearance of this brilliantly appointed, interactive time piece gives a feeling of a brilliance and competence. Select one of many decoration options to add your logo, name or special message to the base of this piece. Let your clients recall a fantastic global achievement as the timepiece swings from a suspended silver loop above your note of recognition. Features a spinning, gimbled clock/frame combo is showcased between chrome pillars and rings set on a matte finished base. Frame holds 1 1/2 diameter photo or message. Imprint Area: 1.38" H X 1.38" W. Unless otherwise specified on your P.O., we will imprint in the direction shown here.